It’s Navratri season now in India.. Though the custom followed is different in various parts of the country, the purpose is the same.. Goddess Lakshmi, Saraswati and Durga are welcomed and songs are sung praising the goddess.. I will try to add in as many songs as possible but before that let me give a small intro on how the festival is celebrated in various parts of the country.. The Festival: This festival called `Navratri’, meaning ‘Nine Nights’, is an ancient and colorful festival. It is celebrated in honour of the Divine Mother (The Power or The Force), representing The Nature. This also is a festival which combines religion, devotion, culture, and recreation. People worship, offer prayers, visit temples, and celebrate for Nine Nights. Folk Dances: The most interesting feature of the festival is `Garba’, a circular dance performed by women. As the dancers whirl around an earthenware pot, a singer and a drummer provide the musical accompaniment. The participants clap in a steady rhythm. The dance usually starts slowly. It gets faster and faster as the music gets more rapid, until the dance abruptly comes to a halt. There is a pause for a while and the dance commences once again, the singer leading with a new song. Dandia-ras: Another dance, which is also very popular, is the `Dandia-ras’ or ‘stick’ dance, in which pairs of men and women join the dance circle, holding small sticks, facing each other. As they whirl to the rhythm of the dance, the pair strikes their sticks together, adding to the joyous atmosphere, then the partner changes and the new pair continues, moving in the circle. All Night Dancing: These Dances are performed in public or arranged privately, for nine continuous nights! They usually commence late in the evening and continue till wee hours of morning. They are very popular in the state, people enjoy a lot. There are a lot of variations in the dance steps and the music and the rhythm. There are contests and the best dancer gets the prize too! Sri Durga MataNavratri – the nine sacred nights is one of the most celebrated festivals of India. This begins from the first day (Pradhamai) after Amavasya in the month of Purattasi as it is known in Tamil. This nine days festival is essentially celebrated to worship Devi and to commemorate the victory of good over evil, i.e. bringing to an end the atrocities of Asuras like Mahishasuran, Shumban, Nishumban, Madhukaidapan, Thumralochanan and Rakthabheejan. During Navrathri Devi is worshipped in the form of Sri Durga for the first three days, as Sri Lakshmi for the second three days and as Sri Saraswati for the next three days. In the south, during Navratri the occassion is also used to invite all the friends, relatives and neighbours over to home to look at the Kolu that is arranged. Every year the young girls in the house along with their mothers vie with each other to create a Kolu with a different look. All the nine days are a non stop entertainment period with songs and dances. 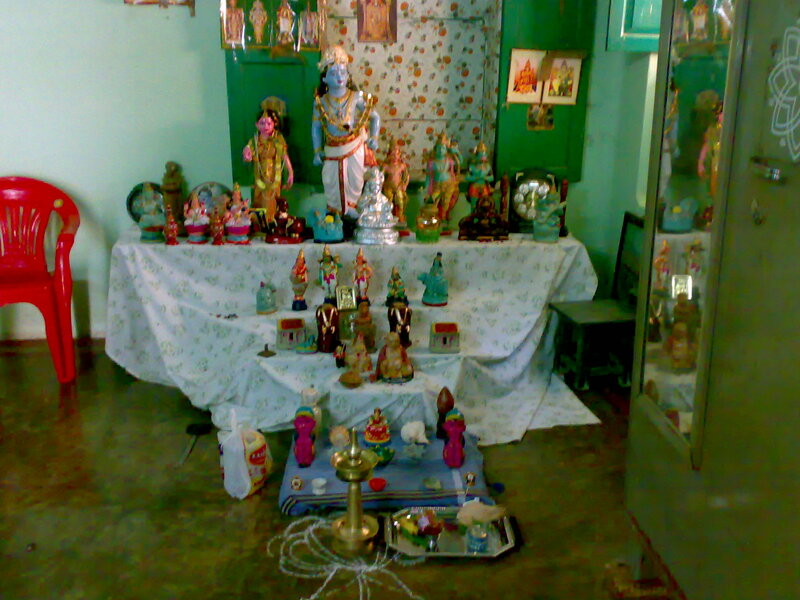 Normally, in every south Indian home, golu/ kolu is kept. Typically, a golu is an arrangement of dolls/ handicrafts etc arranged in a very aesthetic manner, displaying the talents of the young girls in the household. The most common form of golu is to display the dolls etc on a 5 or 7 step frame. Dolls depict different traditional festival, events, etc. No golu is ever complete without the famous Dasha Avtaar, idols of durga, saraswati, lakshmi, Ganpathi, the famous Chettiar couple (the typical pot bellied businessman of the south with his equally proportioned wife in traditional attire, complete with the kudmi (lock of hair)). Other displays include the Meenashi Sundaram kalyana mandapam, Ram-Seetha, Lakshman & Hanumanji idols or the Ramar Pathabhishekham (the coronation of Ram on his return to Ayodhya after the vanvaas). Each day is a day of war between the Asuras and Gods, and each day, at sunset, marks the end of the war for the day, when the lady of the house would make a new chundal (prasad) and offer the prasad to the Lord, after the lamp is lit. The tenth day marks the end of the war when the Durga conquers the evil Asuras and that day, at sunset, the war is over and peace reigns. It is therefore called the Vijayadashmi.. victory of the good over the evil. In the east, especially Calcutta, people go crazy over Durga Puja, from the seventh till the tenth day of this annual festival. The first nine days of the Ashwin are devoted for worshipping the Divine Mother -‘MAA’. This festival commemorates the victory of Goddess Durga over a demon, Mahishasur. 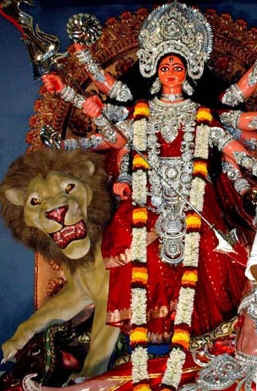 During Navratri, devotees of Durga fast and pray for health and prosperity. They also perform the ‘devi-sthaapna’ in their homes wherein they invite the Goddess and perform ‘pooja-path’ for nine days without consuming any food. Idols of the Goddess Durga are elaborately decorated and worshipped in elaborate pandals for nine days, and on the tenth day immersed in a river or pond. Each day during this festival has religious significance for the devotees. Singing, dancing, sweets & gaiety are an integral part of the Durga Pooja Festival. People send Durga Puja Gifts to dear ones and express good wishes. The festival of Navratri also coincides with the festival of Dussehra or Vijaya Dashmi. Vijaya Dashami (literally meaning ‘The Day marking the Triumph of Good over Evil’) falls on the day after Navratri, and is associated with another legend where Lord Rama killed the demon-king Ravana. In the northern parts of India, Ram Lilas draw from the epic, the Ramayana, to bring the life and times of Lord Rama back to the common folk through dramatic representations. Wishing you a very Happy Navratri!!! Thanks for the link Mohini.. Narendra Chanchal has been one of my favorite when it comes to bhajans.. Luv his voice..
Could you please tell me how to post our navaratri Golu arrangement in this website?